An AppStore for a medical device. Is the talk sponsored by a lawyer office hoping for an easy class action? I really enjoyed your talk, thanks! I would like to suggest the use of http://www.universalsubtitles.org/ to subtitle videos on your blog. I really enjoyed your talk! I’ve been wearing hearing aids for a bit over a month now and I understood a few missing pieces listening to you: compression, how the anti-larsen works, and why music and singing sounds so crap. I’m trying out widex aids right now, and in the middle of your talk I was inspired to give them M-DEX (the bluetooth remote) another go — my first attempt had been crap. And it works! I’d also love to be able to self-tune — the M-DEX allows me to try volume variations, which comes in handy because louder does not always mean better speech comprehension. 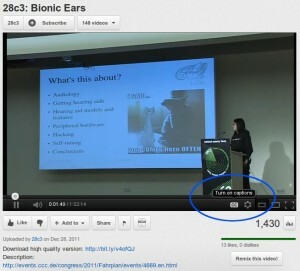 Just out of curiosity, do you know http://hearingaidforums.com? Not really hacking, but I found it a good ressource until now. Great to hear you liked it. I am curious, who is our mutual friend? (You can send me an email for that). Phonak, like Siemens, also uses a proprietary NFC-like communication protocol in their iCom product. Phonak seems to call it HiBAN (Hearing Instrument Body Area Network) and it operates at 10.6 MHz using an NXP chip (I think NxH2180). My belief is that since the hearing aid companies seem hostile to customer tinkering and they love the margins on perhipherals, publishing details of the peripheralHA protocol would just make Phonak, Siemens, and other companies change it to be harder to RE. Also with regards to one of the audience’s questions about reverse engineering the Hi-Pro, the operation is already documented by standard IEC 60118-14. My interpretation is it specifies a universal serial port with a variable voltage supply and leaves the serial bit-stream up to the individual HA manufacturers. The ones I’ve seen just use i2c. So if you wanted, you could probably implement the i2c parts of the Hi-Pro DLL to drive a bus pirate instead.